← Shop Together. Happy Together. After an unexpected break, we’re back! 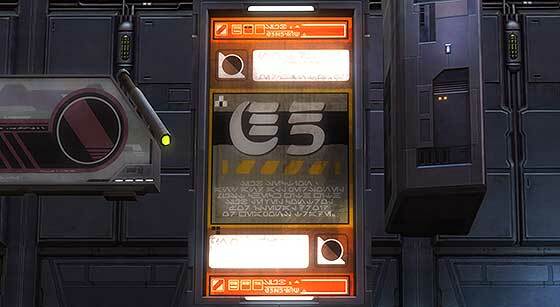 This week, let’s look at this huge poster which hangs over the outdoor docks in Coruscant’s Old Galactic Marketplace. Unlike most other posters you might see in this area, it is not an advertisement. Instead it is a notice of trade restrictions that are probably no longer enforced now that the Migrant Merchants Guide is running the zone. The most notable feature of this poster is the use of the Futhork font in its prominent center section and in the small text at the top and bottom. Conceptual designer Iain McCaig created Futhork as one of Naboo’s writing styles for The Phantom Menace. and it is featured throughout the prequel trilogy. 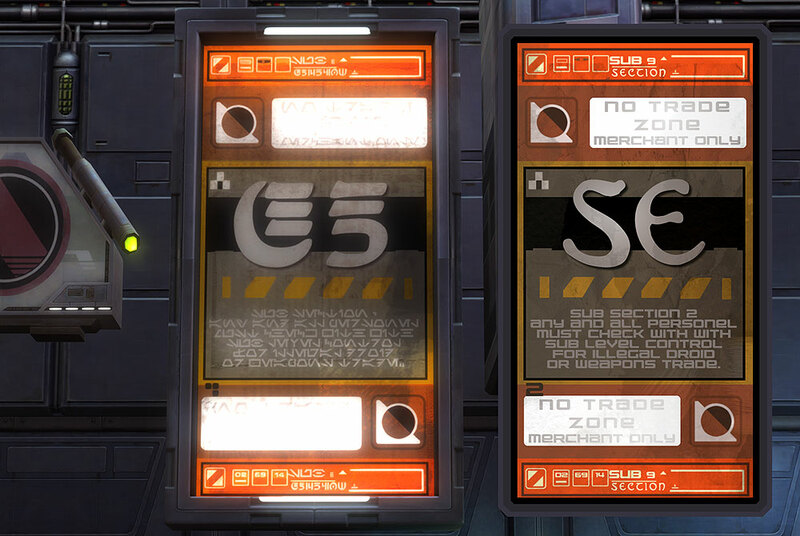 In SWTOR, Futhork and many other languages can be seen most commonly on Nar Shaddaa in the neon and holographic signs that dominate the skyline of the infamous Smuggler’s Moon. Futhork is described as an elegant hand-written font and I imagine it is used in the same way as Blackletter or Gothic script to make a design seem more elegant or official. The poster itself has a nice warm feel that I quite like. The Futhork flourishes make it stand out from other signage in the game. The accidentally repeated word in the third line of the block of text in the center section again exposes the danger of writing in an alien language, but I don’t think it detracts from the overall design. Another nice touch is in the orange tabs at the top and the bottom. Although the layout is the same in both sections, each of the small boxes has its own element. Finally, the text in the two white sections is blown out and difficult to read. If you look at the poster from an angle or play with the levels in Photoshop, however, the text becomes visible. In my translation, I kept the words readable. Since I last posted, patch 5.2 was published and I thought I’d share some quick impressions. Overall, I’m pleased. The story itself is mainly seems to be prologue to the next big arc and thus has a lot to set up: the return to Iokath, the return of two of the game’s signature companions, the renewed conflict between the Republic and Sith, the return of Zakuul’s old gods and the emergence of a traitor in the ranks. That’s a whole lot ground to cover and not everything gets the space it needs, but I’m curious to see where things go from here. Without getting into spoiler territory, one thing that did impress me was the use of Quinn. It’s an understatement to call him one of the game’s most infamous companions. My consular sided with the Republic, and while Elara remained mostly a background character, I was pleased that the story did a good job making Quinn into a quality antagonist who I wouldn’t mind seeing as a recurring villain. Given how story choices work, I’m not sure he’ll ever pop up again, but I never thought I’d want to see more of Quinn! The operation’s first boss Tyth is a fun fight, requiring appropriate coordination on Veteran Mode, but remaining welcoming to new and inexperienced players on Story Mode. I look forward to facing the twins Esne and Aivela next. I haven’t spent too much time in the daily area. I received so many reputation tokens just from the story that I haven’t felt the need to dive too deep into the dailies and have only completed the weekly once. The zone is sprawling and still confusing to me. This is a good thing; I don’t mind knowing that I will need to explore the area and get comfortable with its layout. That said, the map’s tooltips pointing to quest objectives need some work. The environment itself is very cool, and I’m happy to just stop and admire the scenery. However, some of the quests are buggy. I’ve killed the Colossal Droid twice but have yet to receive credit, and surely the Mouse droid daily isn’t meant to be so frustrating and difficult as it is now. I know having to spend power shards to access the quests to control the various droids and vehicles on Iokath has been controversial, but I can see what Bioware is going for with this system. The problem with daily areas is that they get old fast, and adding a mechanic where certain quests can only be unlocked with extra effort strikes me as a neat idea. The notion that taking control of a walker is something I have to save up for makes it a bit of a special event. The rub is in making these quests as fun and rewarding as possible, and I’m not sure they’re there yet. I won’t lie, getting killed by random mobs while wandering around as a mouse droid is not awesome, especially since I have to burn more shards just to try again. My stash of shards is pretty thin right now, but if the Iokath currency becomes like all the other event and area currencies in the game, I’ll eventually have shards coming out of my ears, so having a use for them after I have all the reputation rewards I want doesn’t strike me as a bad idea. Hopefully the bugs will get squashed in short order, and I’m curious to see what comes next. 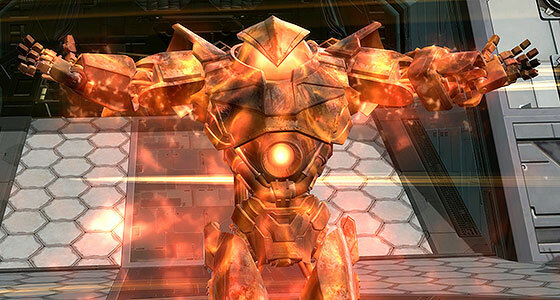 Lastly, SWTOR’s new Game Producer Keith Kanneg and Creative Director Charles Boyd have both made some appearances on the forums recently and their posts have included actual information and teased upcoming improvements. This has been a most welcome change of pace and I’m hopeful this continued engagement with the community will continue. This Week in Aurebesh · That's no moon, that's a SWTOR blog! Powered by WordPress · Contact me: twia@generic-hero.com.